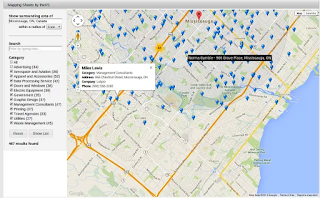 Here is a great tool for Google Maps users. Mapping Sheets is a free add-on to use on Google Sheets to easily plot data from your sheets right into Google Map. 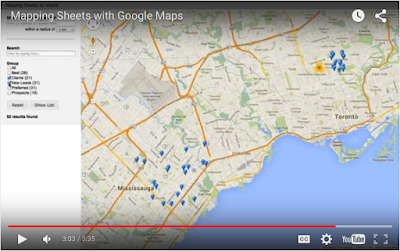 As is demonstrated in the video below, the process of mapping data from sheets to Google maps is simple and easy. First install the app and follow the instructions to authorize the app to access your Google Sheets. Once the installation is complete, open your sheet and fill in your data. There are three main columns you can use to build your map: Title, Filter and Location but you can also add as many columns as you want so you will have more information to display on the map. When your data is ready click on ‘create’ to generate your map. Mapping Sheets also provides you with some interesting features to use on your maps. For instance, when you create your map you can conduct searches within it to look for specific locations related to the entries of your data sheet. Other features include: using checkboxes from the selected Filter column for easy grouping and filtering, narrowing your focus to a specific area surrounding a certain location and many more. Watch the video below to learn more about how to use Mapping Sheets.